University of North Carolina Press (Chapel Hill, North Carolina, 2014). 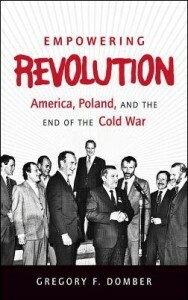 “Empowering Revolution” gives readers a clear sense of the Cold War’s strongly moralistic character. Author Gregory Domber reminds us of the Brezhnev doctrine, “fraternal socialist assistance,” exemplified by the 1968 military intervention in what was then Czechoslovakia, and of Moscow’s intimidation of Warsaw right up until the Gorbachev era. Polish leader Wojciech Jaruzelski found himself between a rock and a hard place, as he had to appease the Soviets yet needed Western financing for economic revitalization. This brings up a strength of Domber: While Jaruzelski has often played the role of dictator in the mainstream media’s imagination, the author depicts him as neither simplistically autocratic nor weak, but as assertive of Poland’s rights, someone who directly told the Americans that he didn’t like his nation being a pawn in the superpower struggles. Given the title, one does not expect an account of the Vatican’s important role, but Catholic readers will nonetheless regret the minimal discussion on St. John Paul II and his heroic stand against his country’s communists. The author also leaves out the spiritual nature of this clash, with the Catholic Church taking a leading role, though snippets of the church’s activity, including that of Polish-American Cardinal John Krol and Poland’s primate, Cardinal Jozef Glemp, are discussed. The book’s main strength is also its weakness: Domber’s penchant for numbers, names and other specifics paints a very lively, detailed portrait of the era, one of more value to historians than to the casual reader. The author explains Cold War doctrine clearly enough, including differentiation and nondifferentiation — terms familiar only to specialists. Nondifferentiation called for minimal interaction with the entire region, primarily to stop Western technology from going to the Soviet Union and to force Moscow to subsidize the Eastern bloc’s economies, thus diverting resources from its military.